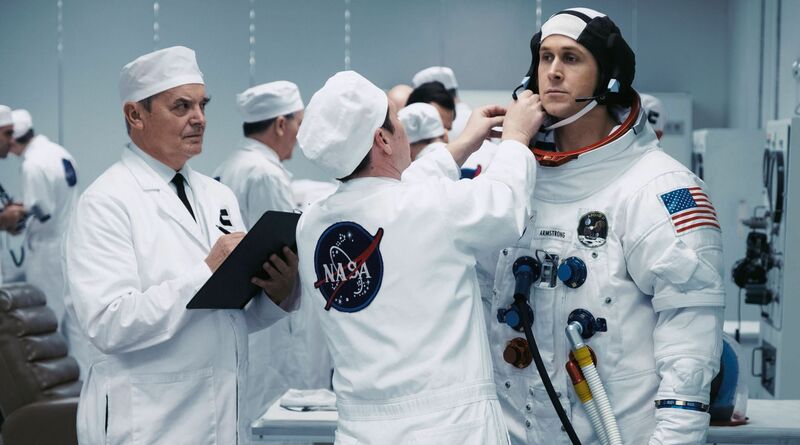 Damien Chazelle’s First Man is a masterful technical achievement, but ultimately far too impenetrable to leave a lasting impression. Biographical dramas, or “biopics” as they more commonly known, are inevitability in Hollywood. For as long as the Academy Awards exist, it’s a safe bet that Hollywood will continue to churn out biopics. The issue, or perhaps I should say my issue, with these biopics has less to do with the genre or even the content itself and much more to do with how conventional both the style of filmmaking and the subjects in these movies tend to be. Not only do biopics typically center on protagonists that are white, heterosexual, and male, but also the talent behind the camera – including the writers and directors – fail to distinguish these movies from one another. As such, you end up with a genre awash with mediocrity, movies that are the cinematic equivalent of a Wikipedia page. Enter Damien Chazelle’s First Man, a Neil Armstrong biopic that follows his journey during NASA’s mission from 1961 to 1969 to land a man on the moon. Starring Ryan Gosling and Claire Foy as Neil and Janet Armstrong, the movie has all the pieces of a traditional biopic – a man with a dream and a family waiting at home for him, a seemingly impossible mission with a government desperate for its success, and a preordained climax that not only completes the protagonist’s arc but also drives home the message of the infallible courage of men. With Chazelle in the driver’s seat, First Man attempts to rise above traditional trappings of the biopic genre, succeeding, but only just so. With previous directing credits including Whiplash and La La Land, Damien Chazelle quickly earned a reputation as an exciting new talent. Both movies exemplify Chazelle’s unique cinematic energy, one that delivers onto the audience feelings of frenzy, passion, and excitement by telling stories about people with an insatiable need to see their dreams come to life. Here’s what is so confounding about First Man: While Armstrong’s story aligns perfectly with Chazelle’s body of work, it’s delivered unto the audience in an empty vehicle, failing to capture the energy that made Chazelle’s previous films so captivating. One would hardly seek to call First Man a rigorously accurate depiction of NASA’s mission to land a man on the moon. The different phases and missions that led to Apollo 11’s mission to the moon are only thinly traced, the political atmosphere surrounding NASA’s efforts remain in the margins, and any actual science behind the mission to the moon is left unmentioned. Instead, Chazelle chooses to take an interior approach, using Neil Armstrong himself as the lens through which to take the journey to the moon – making a movie that is as much about Armstrong the father, the husband, and the friend, as it is about Armstrong the astronaut. Unfortunately, while Armstrong is undoubtedly the perfect protagonist for this story, the movie’s depiction of him is so opaque, kept at such a distance, that he fails to give the audience the kind of character-driven emotional through-line that made Chazelle’s previous movies stand out. Following Neil Armstrong for close to a decade, First Man seems to want to tell a story about the personal costs of man’s ambition, but the ways in which the movie seeks to articulate that – be it Neil’s deteriorating relationship with his family or his unyielding attempts to prove himself to his colleagues – fail to leave a significant mark. Gosling’s performance as Neil definitely helps do some heavy lifting, bringing nuance and warmth to moments where the script fails him. However, it’s still not enough. In fact, the sort of impenetrability that characterizes so much of the movie feels at odds with what Claire Foy brings to the role of Janet Armstrong – a performance that, despite a weak script, manages to make the audience feel something, even if not for very long. What’s so discouraging about this lack of emotional core is that First Man excels in almost every other department. As a visceral movie-going experience, First Man delivers. 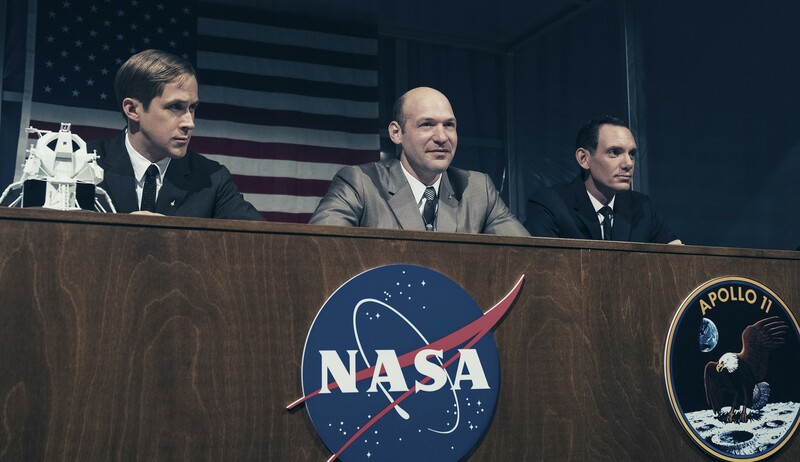 Impeccably crafted sound design, a distinct and jarring visual style, and period-specific set and costume design infuse First Man the kind of first-person point of view that enhance the experience the cinematic experience. The intense visual style of the movie combined with an tremendous score that moves and crescendos at all the right moments. It’s First Man’s technical proficiency and attention to craft, that makes comparative weakness of its narrative stand out so clearly. There’s a case to be made that First Man taps into the ways in which the myth behind a hero’s identity – especially those as well known as Neil Armstrong – becomes bigger than the hero itself. Perhaps Neil’s impenetrability is an intentional approach taken to articulate how heroes are not always the people or myths we believe them to be. But if that’s the choice Chazelle is making with First Man, it’s not one I believe works to the movies advantage. On some level, movies are an amalgam of choices made by the filmmakers that give way to the final product – the one we experience either in the theater, at home, or hell, even on an airplane.Whether or not you enjoy a movie comes down to whether or not you enjoy enough of those choices. Do the good choices outweigh the bad ones? Sometimes, especially with movies like First Man, a few bad choices get in the way – no matter how many other great choices are made. First Man is an incredibly ambitious movie, especially from a technical perspective, full of choices that enhance the scope and significance of the story. Unfortunately, not enough of those choices are made to improve the story’s weak emotional landscape. For all that First Man does right, it never answers a pretty fundamental question: Why should we care?